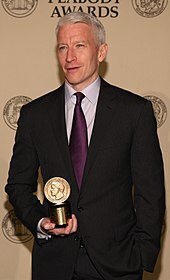 Anderson Hays Cooper (born June 3, 1967) is an American journalist, television personality, and author. He is the primary anchor of the CNN news show Anderson Cooper 360°. The program is usually broadcast live from a New York City studio; however, Cooper often broadcasts live from CNN's studios in Washington, D.C., or on location for breaking news stories. In addition, he is a correspondent for 60 Minutes. Cooper was born in Manhattan, New York City, the younger son of the writer Wyatt Emory Cooper and the artist, fashion designer, writer, and heiress Gloria Vanderbilt. His maternal grandparents were millionaire equestrian Reginald Claypoole Vanderbilt and socialite Gloria Morgan Vanderbilt, and his maternal great-great-great-grandfather was business magnate Cornelius Vanderbilt, who founded the prominent Vanderbilt shipping and railroad fortune. He is also a descendant, through his mother, of Civil War brevet Major General Hugh Judson Kilpatrick, who was with General William T. Sherman on his march through Georgia. Through his "Vanderbilt" line, he is a second cousin, once removed, of screenwriter James Vanderbilt. Cooper's media experience began early. As a baby, he was photographed by Diane Arbus for Harper's Bazaar. At the age of three, Cooper was a guest on The Tonight Show on September 17, 1970, appearing with his mother. At the age of nine, he appeared on To Tell the Truth as an impostor. From age 10 to 13, Cooper modeled with Ford Models for Ralph Lauren, Calvin Klein and Macy's. Cooper's older brother, Carter Vanderbilt Cooper, died by suicide on July 22, 1988, at age 23, by jumping from the 14th-floor terrace of Vanderbilt's New York City penthouse apartment. Gloria Vanderbilt later wrote about her son's death in the book A Mother's Story, in which she expresses her belief that the suicide was caused by a psychotic episode induced by an allergy to the anti-asthma prescription drug salbutamol. Anderson cites Carter's suicide for sparking his interest in journalism. "Loss is a theme that I think a lot about, and it's something in my work that I dwell on. I think when you experience any kind of loss, especially the kind I did, you have questions about survival: Why do some people thrive in situations that others can’t tolerate? Would I be able to survive and get on in the world on my own?" Cooper was educated at the Dalton School, a private co-educational university preparatory day school in New York City. At age 17, after graduating from Dalton a semester early, Cooper traveled around Africa for several months on a "survival trip". He contracted malaria on the trip and was hospitalized in Kenya. Describing the experience, Cooper wrote "Africa was a place to forget and be forgotten in." Cooper went on to attend Yale University, where he resided in Trumbull College, and was inducted into the Manuscript Society, majoring in political science and graduating with a B.A. in 1989. During college, Cooper spent two summers as an intern at the Central Intelligence Agency while studying political science. He pursued journalism with no formal journalistic education and is a self-proclaimed "news junkie since [he] was in utero." After his first correspondence work in the early 1990s, he took a break from reporting and lived in Vietnam for a year, during which time he studied the Vietnamese language at Vietnam National University, Hanoi. After Cooper graduated from Yale University, he tried to gain entry-level employment with ABC answering telephones, but was unsuccessful. Finding it hard to get his foot in the door of on-air reporting, Cooper decided to enlist the help of a friend in making a fake press pass. At the time, Cooper was working as a fact checker for the small news agency Channel One, which produces a youth-oriented news program that is broadcast to many junior high and high schools in the United States. Cooper then entered Myanmar on his own with his forged press pass and met with students fighting the Burmese government. He was ultimately able to sell his home-made news segments to Channel One. After reporting from Myanmar, Cooper lived in Vietnam for a year to study the Vietnamese language at the University of Hanoi. Persuading Channel One to allow him to bring a Hi-8 camera with him, Cooper soon began filming and assembling reports of Vietnamese life and culture that aired on Channel One. He later returned to filming stories from a variety of war-torn regions around the globe, including Somalia, Bosnia, and Rwanda. In 1995, Cooper became a correspondent for ABC News, eventually rising to the position of co-anchor on its overnight World News Now program on September 21, 1999. In 2000, he switched career paths, taking a job as the host of ABC's reality show The Mole. Cooper was also a fill-in co-host for Regis Philbin for the TV talk show Live with Regis and Kelly in 2007 when Philbin underwent triple-bypass heart surgery. He periodically serves as guest co-host on Live with Kelly and Ryan. Cooper left The Mole after its second season to return to broadcast news. In 2001, he joined CNN, commenting, "Two seasons was enough, and 9/11 happened, and I thought I needed to be getting back to news." His first position at CNN was to anchor alongside Paula Zahn on American Morning. In 2002, he became CNN's weekend prime-time anchor. Since 2002, he has hosted CNN's New Year's Eve special from Times Square. I think the notion of traditional anchor is fading away, the all-knowing, all-seeing person who speaks from on high. I don't think the audience really buys that anymore. As a viewer, I know I don't buy it. I think you have to be yourself, and you have to be real and you have to admit what you don't know, and talk about what you do know, and talk about what you don't know as long as you say you don't know it. I tend to relate more to people on television who are just themselves, for good or for bad, than I do to someone who I believe is putting on some sort of persona. The anchorman on The Simpsons is a reasonable facsimile of some anchors who have that problem. In 2005, Cooper covered a number of important stories, including the tsunami damage in Sri Lanka; the Cedar Revolution in Beirut, Lebanon; the death of Pope John Paul II; and the royal wedding of Prince Charles and Camilla Parker Bowles. In August 2005, he covered the Niger famine from Maradi. In 2005, during CNN coverage of the aftermath of Hurricane Katrina, he confronted Sen. Mary Landrieu, Sen. Trent Lott, and the Reverend Jesse Jackson about their perception of the government response. As Cooper said later in an interview with New York magazine, “Yeah, I would prefer not to be emotional and I would prefer not to get upset, but it's hard not to when you’re surrounded by brave people who are suffering and in need.” As Broadcasting & Cable magazine noted, "In its aftermath, Hurricane Katrina served to usher in a new breed of emo-journalism, skyrocketing CNN's Anderson Cooper to superstardom as CNN's golden boy and a darling of the media circles because of his impassioned coverage of the storm." In September 2005, the format of CNN's NewsNight was changed from 60 to 120 minutes to cover the unusually violent hurricane season. To help distribute some of the increased workload, Cooper was temporarily added as co-anchor to Aaron Brown. This arrangement was reported to have been made permanent the same month by the president of CNN's U.S. operations, Jonathan Klein, who has called Cooper "the anchorperson of the future." Following the addition of Cooper, the ratings for NewsNight increased significantly; Klein remarked that "[Cooper's] name has been on the tip of everyone's tongue." To further capitalize on this, Klein announced a major programming shakeup on November 2, 2005. Cooper's 360° program would be expanded to 2 hours and shifted into the 10 pm ET slot formerly held by NewsNight, with the third hour of Wolf Blitzer's The Situation Room filling in Cooper's former 7 pm ET slot. With "no options" left for him to host shows, Aaron Brown left CNN, ostensibly having "mutually agreed" with Jonathan Klein on the matter. In early 2007, Cooper signed a multi-year deal with CNN that would allow him to continue as a contributor to 60 Minutes, as well as doubling his salary from $2 million annually to a reported $4 million. In 2007, he began hosting CNN Heroes: An All-Star Tribute, a show which honors and recognizes extraordinary deeds by ordinary people. In October 2007, Cooper began hosting the documentary Planet in Peril, with Sanjay Gupta and Jeff Corwin on CNN. In 2008, Cooper, Gupta, and Lisa Ling from National Geographic Explorer teamed up for a sequel, Planet in Peril: Battle Lines, which premiered in December 2008. In September 2010, Warner Bros. and Telepictures (both corporate siblings of CNN) announced that Cooper had signed an agreement to host a nationally syndicated talk show. The journalist Brian Stelter (at the time employed by The New York Times, and now by CNN), reported on Twitter that the new Warner Bros. daytime talk show would be named Anderson (now titled Anderson Live). The show premiered on September 12, 2011, and, as part of negotiations over the talk show deal, Cooper signed a new multi-year contract with CNN to continue as the host of Anderson Cooper 360°. On October 29, 2012, it was announced that Anderson Live would end at the conclusion of its second season. The show, slightly renamed after season one and revamped with a variety of co-hosts, failed to achieve the ratings distributor Warner Brothers hoped for. The final Anderson Live aired on May 30, 2013. Along with Martha Raddatz, Cooper moderated the second presidential election debate between Hillary Clinton and Donald Trump. This made him the first openly gay person to moderate a presidential debate. In 2017, Andy Cohen alongside with Anderson Cooper, succeeded Kathy Griffin as co-host of CNN's New Year's Eve coverage.They again co-hosted CNN's New Year's Eve for 2018.
Cooper has been a correspondent for the CBS News program 60 Minutes since 2007, while concurrently serving as a CNN anchor and correspondent. Andy Cohen and Anderson Cooper announced that they would be going on a national tour to perform their conversational stage show AC2 beginning in March 2015. The tour opened in Boston, followed by Miami Beach, Chicago and Atlanta. The idea for the show came about after Cooper interviewed Cohen about his then-latest book, The Andy Cohen Diaries, at an event at the 92nd Street Y in New York City. Since then, the two-man show has continued to tour reaching over 50 cities as of October 2018.
Cooper was the narrator for the 2011 Broadway revival of How to Succeed in Business Without Really Trying, directed by Rob Ashford and starring Daniel Radcliffe. A freelance writer, Cooper has authored a variety of articles that have appeared in many other outlets, including Details magazine. In May 2006, Cooper published a memoir for HarperCollins, Dispatches from the Edge, detailing his life and work in Sri Lanka, Africa, Iraq and Louisiana over the previous year. Some of the book's proceeds are donated to charity. The book topped The New York Times Best Seller list on June 18, 2006.
Cooper has two older half-brothers, Leopold Stanislaus "Stan" Stokowski (b. 1950), and Christopher Stokowski (b. 1952), from Gloria Vanderbilt's ten-year marriage to the conductor Leopold Stokowski. He said to Oprah Winfrey—while promoting his book—that he had suffered from dyslexia as a child. In August 2007, he confirmed his "mild dyslexia" on The Tonight Show to Jay Leno, who also has dyslexia. I've begun to consider whether the unintended outcomes of maintaining my privacy outweigh personal and professional principle. It's become clear to me that by remaining silent on certain aspects of my personal life for so long, I have given some the mistaken impression that I am trying to hide something—something that makes me uncomfortable, ashamed or even afraid. This is distressing because it is simply not true. ... The fact is, I'm gay, always have been, always will be, and I couldn't be any more happy, comfortable with myself, and proud. In 2014, Cooper and his partner purchased Rye House, a historic estate in Connecticut. Apple CEO Tim Cook turned to Cooper for advice before he subsequently made the decision to publicly come out as gay. Also in 2014, Cooper appeared in Henry Louis Gates' Finding Your Roots, where he learned of an ancestor, Burwell Boykin, who was a slave owner from the Southern United States. In March 2018, Cooper confirmed that he and his long-time boyfriend Benjamin Maisani had split up. Dispatches from the Edge: A Memoir of War, Disasters, and Survival (Harper Perennial, 2006). ISBN 978-0061451515. The Rainbow Comes and Goes (Harper Perennial, 2016). ISBN 978-0062454942. ^ Karger, Dave (May 23, 2006). "Anderson Cooper, memoirist -- and Idol fanatic". Entertainment Weekly. www.ew.com. Retrieved July 13, 2010. ^ Kenneally, Tim (October 29, 2012). "Anderson Cooper's talk show to end after second season". The Wrap via Yahoo.com. Retrieved October 30, 2012. ^ Whitaker, Barbara (July 27, 1988). "Simple Service for Vanderbilt's Son". Newsday. p. 4; Section: News. ^ Green, Tyler. "MODERN ART NOTES: Name That Baby". ArtsJournal. Archived from the original on September 26, 2007. Retrieved June 30, 2007. ^ The New York Times, September 17, 1970, page 95. ^ a b c d e Van Meter, Jonathan, "Unanchored," New York, September 19, 2005 (Retrieved on September 27, 2006). ^ Bronson, Po (February 12, 2007). "Anderson Cooper's Private War". Po Bronson blog. Retrieved July 7, 2012. ^ Palka, Mary Kelli (October 21, 2007). "Anderson Cooper: He runs to where others are running from". Florida Times-Union. www.jacksonville.com. Retrieved July 13, 2010. ^ Bercovici, Jeff (September 6, 2006). "Anderson Cooper's CIA secret". Radar. Retrieved June 30, 2007. ^ Cooper, Anderson (September 6, 2006). "My summer job ... nearly 20 years ago". Anderson Cooper 360° Blog. Retrieved April 23, 2016. ^ a b c d e Hirschman, David S. (May 11, 2006). "So what do you do, Anderson Cooper?". Mediabistro.com. Retrieved June 30, 2007. ^ "Anchors & Reporters: Anderson Cooper". CNN. Archived from the original on November 26, 2009. Retrieved November 2, 2009. ^ Hirschman, David S. "Articles: So What Do You Do, Anderson Cooper?". mediabistro.com. Retrieved August 6, 2011. ^ Bonawitz, Amy (March 13, 2007). "Anderson Cooper Fills in For Regis". CBS News. CBS. Retrieved July 13, 2010. ^ "Blown Away by Katrina". Broadcasting & Cable. December 12, 2005. Retrieved June 30, 2007. ^ Jensen, Elizabeth, "An anchor who reports disaster news with a heart on his sleeve", The New York Times, September 12, 2005 (Retrieved September 27, 2006). ^ Carter, Bill, "CNN ousts evening anchor and embraces rising star", The New York Times, November 3, 2005 (Retrieved September 27, 2006). ^ Carter, Bill, "CNN ousts Aaron Brown and gives slot to Anderson Cooper", The New York Times, November 2, 2005 (Retrieved September 27, 2006). ^ "Anderson Cooper Free Dives with Great White Sharks in South Africa". CNN, USA. December 15, 2017. Retrieved January 30, 2017. ^ "Anderson Cooper Swims with Great White Sharks in South Africa". YouTube.com. CNN, USA. December 12, 2008. Retrieved January 30, 2017. ^ "Twitter / Warner Bros. has settled on a name for Anderson Cooper's daytime talk show, coming in September 2011. It's "Anderson."". Twitter.com. December 12, 2010. Retrieved August 6, 2011. ^ "Anderson Cooper New Daytime Talk Show". AndersonCooper.com. Retrieved September 19, 2011. ^ "Anderson Cooper to Host Daytime Talk Show". The Spy Report. Media Spy. October 1, 2010. Archived from the original on October 4, 2010. Retrieved October 2, 2010. ^ Stelter, Brian (September 30, 2010). "CNN's Anderson Cooper in Daytime Talk Show Deal". The New York Times. Archived from the original on October 2, 2010. Retrieved October 2, 2010. ^ Grynbaum, Michael M. (October 10, 2016). "Martha Raddatz and Anderson Cooper Steered Debate With Sharp Questions". The New York Times. ISSN 0362-4331. Retrieved October 12, 2016. ^ "History was made at last night's debate… but not by Clinton or Trump". PinkNews. October 10, 2016. Retrieved October 13, 2016. ^ Steinberg, Brian (October 11, 2017). "CNN Will Replace Kathy Griffin With Andy Cohen for New Year's Eve". Variety. Retrieved November 18, 2017. ^ Katz, A.J. (January 3, 2018). "The Duo of Anderson Cooper and Andy Cohen Led CNN to Its Most-Watched New Year's Eve Ever". Adweek. Retrieved April 28, 2018. ^ Andy Cohen Returns to Co-Host New Year's Eve Live Alongside Anderson Cooper Daily Dish, Bravo TV, 4 December 2018.Retrieved: 31 December 2018. ^ Shanahan, Mark (January 2, 2018). "Anderson Cooper and Andy Cohen say Boston show won't be all about politics". The Boston Globe. Retrieved June 27, 2018. ^ a b Nichols, JamesMichael (March 20, 2015). "Anderson Cooper And Andy Cohen Announce 'AC2' Tour". Huffington Post. Retrieved June 27, 2018. ^ Kelley, Quinn (April 27, 2017). "Andy Cohen, Anderson Cooper to bring boozy tales, 'Housewives' taglines to Baltimore". Baltimore Sun. Retrieved June 27, 2018. ^ Stewart, Allison (April 10, 2018). "Anderson Cooper and Andy Cohen: Nothing is off-limits for AC2 tour". Chicago Tribune. Retrieved June 27, 2018. ^ "Andy Cohen Kept Texting Anderson Cooper During Trump's Helsinki Fiasco". The Late Show with Stephen Colbert. July 19, 2018. Retrieved July 19, 2018 – via YouTube. ^ "Voice of Anderson Cooper to Narrate HOW TO SUCCEED IN BUSINESS WITHOUT REALLY TRYING". BroadwayWorld.com. January 18, 2011. Retrieved February 23, 2011. ^ Patrick Phillips (March 1, 2007). "Anderson Cooper: 'I Didn't Go to Anchor School'". I Want Media. Retrieved January 3, 2007. ^ "Side Dish". New York Daily News. Archived from the original on February 9, 2007. Retrieved January 3, 2007. ^ Hubbard, Kim (May 1996). "Living with Loss". People. Retrieved December 15, 2008. ^ "Books That Made a Difference to Anderson Cooper". O, The Oprah Magazine. July 2005. Archived from the original on July 6, 2008. Retrieved November 10, 2011. ^ Stelter, Brian (July 2, 2012). "Anderson Cooper Says, "The Fact Is, I'm Gay"". The New York Times. Retrieved July 2, 2012. ^ "Anderson Cooper: "The Fact Is, I'm Gay."". The Daily Beast. Archived from the original on July 2, 2012. Retrieved July 2, 2012. ^ "Who Apple's Tim Cook turns to for advice". afr.com. August 15, 2016. Retrieved October 10, 2016. ^ "PBS". September 22, 2014. Retrieved October 9, 2014. ^ Jenée Desmond-Harris (February 6, 2015). "Anderson Cooper was pretty delighted to find out a slave killed his ancestor with a farm hoe". Vox. Retrieved July 10, 2016. ^ Pasquini, Maria; Dowd, Kathy Ehrich; Stone, Natalie (March 15, 2018). "Anderson Cooper Says He and Boyfriend Benjamin Maisani Split 'Some Time Ago'". People. ^ a b c d e Karsnak, Mike (May 12, 2005). "Tenacity marks winning careers of TV journalist, marketing CEO – Honorary degree recipients". The Star-Ledger. Newark, New Jersey. p. 2. ^ a b c Watson, Stephanie (2007). Anderson Cooper: Profile of a TV Journalist. Rosen Publishing Group. pp. 61–62. ISBN 1-4042-1907-2. ^ a b Willer-Allred, Michele (February 17, 2009). "For CNN's Cooper, desire to travel leads to career". Ventura County Star. California. ^ "12th Annual GLAAD Media Awards" (Press release). GLAAD.org. April 16, 2001. Archived from the original on June 4, 2008. ^ "Coverage of Hurricane Katrina 2005". The Peabody Awards. www.peabody.uga.edu. Archived from the original on June 10, 2010. Retrieved July 13, 2010. ^ "2005 National Headliner Award Winners: Broadcast television networks, cable networks, and syndicators". NationalHeadlinerAwards.com. Archived from the original on May 5, 2006. ^ "Headliner Award winners". The Press of Atlantic City. New Jersey: South Jersey Publishing Company. May 15, 2005. p. C6. ^ a b "27th Annual News & Documentary Emmy Awards". EmmyOnline.org. September 25, 2006. Archived from the original on July 24, 2008. Retrieved June 30, 2007. ^ a b Associated Press (September 27, 2006). "CBS and PBS lead winners of Emmy news awards". The Record. Kitchener, Ontario, Canada. p. B5. ^ a b "28th Annual News & Documentary Emmy Awards Nominees". EmmyOnline.org. September 28, 2011. Archived from the original on December 2, 2007. Retrieved July 17, 2007. ^ a b "News and Docu Emmy Nominations 2008: PBS is Frontrunner". emanuellevy.com. September 27, 2011. Retrieved July 15, 2008. ^ Katz, Jonathan M. (July 13, 2010). "Medals for Haiti recovery, little for homeless". The Huffington Post. Associated Press. Retrieved November 10, 2011. ^ a b "32nd Annual News & Documentary Emmy Awards". EmmyOnline.org. September 26, 2011. Archived from the original on September 29, 2011. Retrieved September 26, 2011. ^ Ricky Carter (February 21, 2013). "Anderson Cooper to receive Vitto Russo Award at the 24th Annual GLAAD Media Awards". GLAAD.org. Retrieved February 22, 2013. ^ a b "Anchors & Reporters – Anderson Cooper". CNN. Time Warner. 2010. Archived from the original on July 15, 2010. Retrieved July 13, 2010. "Anderson Cooper collected news and commentary". The New York Times.